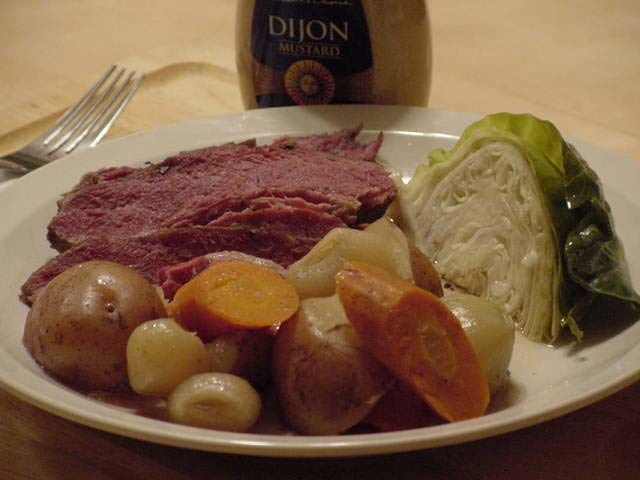 As it turns out, corned beef and cabbage is about as Irish as Spaghetti and Meatballs is Italian. At best it can be considered a recent Irish-American tradition for St. Patrick's Day. Most cattle was used for milk, not for eating. Apparently, they were fond of pig. You can get the full story here. Authentic or not, it tastes good. This was the third of the slow cooker test recipes. I think by the third time I had a better sense of how the slow cooker works. I cut down on the cooking time a little since my cooker seems to run hot. The recipe said to add water just to cover the meat. It was a lot of water, which was why I had a bad feeling about it. But it turned out ok. You cook the beef and vegetables first, then you cook the cabbage after you take the other stuff out. Ironically, the cabbage was a little undercooked, but that was easily fixed in the microwave. And better undercooked than mush, as I always say. I had originally planned to make Irish stew, but I couldn't find any lamb so I changed plans mid-shopping. The only real difference is that I had already put the boiler onions into my basket and forgot to switch them out for a regular yellow onion, so I just used the boilers. I don't think it made a difference, except that boiler onions get really sweet when you cook them. They tasted fine, but I think regular onion might blend in a bit better. I also made a point of getting the whole cloves the recipe called for rather than using ground. I'm glad I did that because I think that's one of the things that made the Lucky Chili taste funny. I also substituted vegetable broth for the beer. And I just realized I used two tablespoons of brown sugar instead of the two teaspoons. That was simply a mistake--I assumed it was two tablespoons. Who firmly packs two teaspoons of brown sugar? This was ridiculously easy to make. It's probably not the healthiest way to eat beef, but every once in a while you just need to go for it. Put potatoes, carrots and onion in slow cooker. Lay corned beef on top of the vegetables and sprinkle with the seasonings from packet, the cloves, peppercorns, and brown sugar. If the meat is too big to lie flat in your cooker, cut it in half and stack the pieces one atop the other. Add the beer and enough water to just cover the brisket. Cover and cook on low for 9-11 hours. Remove the corned beef and place in a serving casserole. Arrange the vegetables around the beef; cover with aluminum foil to keep warm. Put the cabbage in the cooker with the cooking liquid and turn the setting to high. Cover and cook until crisp-tender, 20-30 minutes. Serve the beef, sliced across the grain, with the mustard, vegetables, and cabbage. Pass the juice from the crock in a bowl. Why can't you bring some ginger bread to the yarn store? Humm?